I received a complimentary Blueair Sense Air Filter in exchange for an honest review. All opinions are my own. When you live in the woods in a house with three dogs and three cats, the air gets a bit stuffy. My dogs are constantly tracking in pollen, which of course makes me sneeze my head off. All that sneezes sends my own germs hurtling through the air. It’s a horrible cycle. Air filters are pretty much a necessity for me! My favorite so far is definitely Blueair Sense! BlueAir Sense isn’t just a stylish air filter, it’s an incredibly efficient one too! Their patented HEPASilent filter technology catches up to six times more dirt than other air filters. It removes every type of particulate air pollutant including allergens, pollen, mold spores, dust, pet dander, bacteria, and viruses. Viruses! Do you know what that means? You know those colds that cycle through your house in the winter? It may actually eat those suckers! I’m not saying no one will ever get sick again, but it does help clean the air without using a ton of chemicals! Air gets sucked in to the Blueair System through the incredibly quiet fan. Nasty particles pass through the ion chamber, where they are electrically charged. Those particles then get stuck to the filter, so they’re locked away, unable to circulate back into your air. I’m sure that’s an over-simplification of the process. I’m not a scientist or engineer. Honestly, my main concern is whether or not it makes my air fresher and cleaner. While I have no way of testing my air, I can say that it FEELS cleaner. I don’t sneeze as often either! 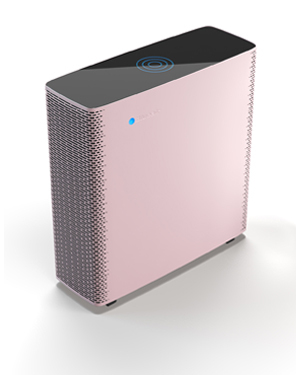 There are a couple of things that I really love about the Blueair Sense. It’s so very, very quiet. In fact, unless you have it on the highest setting, you most likely won’t hear it at all. Even on high, it’s not terribly loud. Filters are easy to insert and change. When your Blueair Sense arrives, you’ll need to unwrap the filters and pop them in correctly. It took seconds to do this. When it’s time to change your filter (or if you somehow put it in wrong), you’ll see a red light to let you know. It comes in different colors! I love the sleek look of my black unit, but it also comes in white, pink, grey, brown and blue. The pink would be perfect for a girl’s nursery, don’t you think? At 22 pounds, the Blueair Sense is a bit heavier than I thought it would be, but to me that says it’s also heavy on cleaning power. It’s not, however, heavy on electrical power. It has the EnergyStar approval and uses very little electricity, so you won’t see your bill skyrocket with regular use. Overall, I’m thrilled with my Blueair Sense. I’d highly recommend it to any family with allergies, asthma or pets. Visit Blueair to learn more about the Sense and other types of air filters and to find out where to buy. Follow on Facebook and Twitter to keep up with news, including contests! Do you suffer from allergies or asthma? How would Blueair Sense help you in your home? The Blueair Sense filter sounds like something I really need to try for my home. I love that it filters out 99.97% of air pollutants. That’s incredible! Home is the place where we feel very free and get relaxed. As a bachelor I live a little bit in the outskirts of the city, the dust there is a a lot , when I enter my home I feel like the the air is not clean a sense of dust is felt.I think this blue air sense air filter is really a perfect product for me. Its amazing to know that it clears almost 99 % of air pollutants. I am surely gonna try this. 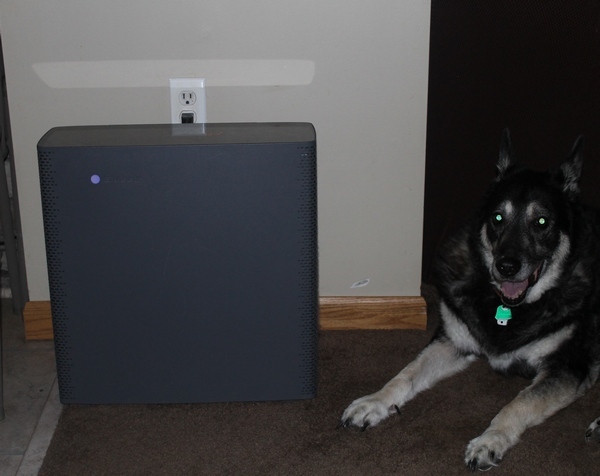 thanks for this great article about the Blueair Sense Air Filter. I also like the design of it and the fact that it`s very quiet. Especially for people who have asthma the Air Filter will be perfect.